So, usually you hear about the winery being the star of the show. Tonight’s wine turned that all on it’s head. Tonight I’m drinking the 2006 Carter Vineyard Hillblock Pinot Noir. Yes, that’s right, this wine is named for its vineyard. This vineyard was planted in 1983 (long before I ever learned to like wine) and the wine is produced by Ken Wright. Ken Wright also makes a Carter Vineyard Pinot Noir under the Ken Wright label. This Pinot has a nose of earth, black cherry, raspberry and smoke, and it has a silky texture and a tart acidity. It tastes of subtle raspberry, spice and smoke. The new French oak that this wine was aged in provides a nice balance to the tannins. 2006 was a year for big, bold Pinots and this wine is no exception. I suppose my only critique would be that it is a bit short on the finish. Jon opened it on a whim and it paired nicely with my frozen pepperoni and veggie pizza (in case you were thinking I was a wine snob, I think I just gave myself away!). Tomorrow perhaps I’ll have my other glass with something more sophisticated – macaroni and cheese with cut up hotdogs maybe! Ha! The other night Jon opened a bottle of the 2008 Anne Amie Pinot Blanc. We haven’t been to Anne Amie for a couple of years, and this bottle reminded me that we should go again. Anne Amie is technically family owned, but… It is one of the many businesses of the R.B. Pamplin Corporation, a family-owned company with annual sales approaching $700 million. Robert B. Pamplin, Jr. is the founder of the Portland Tribune newspaper, Columbia Empire Farms, and Your NorthWest retail stores, in addition to Anne Amie Vineyard. Of course, I can’t be too hard on this large, family business, because Robert B. Pamplin, Jr. is known for his philanthropy and the winery has earned certifications in Low Input Viticulture and Salmon-Safe practices. When you visit Anne Amie, their tasting room staff are friendly and approachable and happy to share their knowledge of the wines you are tasting. Their lineup is always excellent, not a bad one in the bunch. Jon and I once bought a bottle of their Cuvee A Amrita, and watched it disappear in less than 5 minutes when we shared it with Jon’s sisters and cousins at an impromptu hot tub pool party. Yep, I’d say that was a success! But I digress. The 2008 Pinot Blanc has a nose of light butter and crisp citrus, which gives way to a wonderful balanced flavor of butter and pineapple. The key word here is balance, because the French oak aging is done so expertly that the oak and butter do not overpower the citrus flavors in the wine. Very well done. 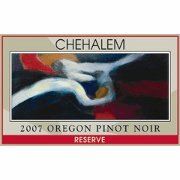 The other night, my debate wine was the 2007 Chehalem Reserve Pinot Noir. I’ve blogged about Chehalem before because it is absolutely one of my favorite wineries. This Pinot is ready to drink now. 2007 was a year of softer, more elegant Pinots, and I think this one is a great example of the vintage. The nose is strawberry and smoke, with a very light mouthfeel. It tastes of strawberry, cherry and the same smoke that is evident on the nose. At this age, there is very little of the tart acidity that so many younger Pinots possess. So how to compare it to the debaters? Well, this wine is refined. It doesn’t talk over the moderator, doesn’t try to get the last word in, and doesn’t step on anybody else to try to get its point in. It just stands on its own merits. The weather was terrible today. After weeks of dry weather – 80 some days with no rain! – we finally got some blustery, stormy weather on Friday. The wind picked up last night and continued through today. We have a lot of leaves and small branches to clean up once the weather clears! So to honor the terrible weather – I made some comfort food. Spaghetti chicken bake, as I like to call it. Spaghetti with sauce and veggies, cooked in a casserole dish with a couple of chicken breasts and some shredded cheese. Baked long enough that the cheese forms a delicious crust. And to go with our meal, Jon opened up the Cathedral Ridge 2010 Necessity Red. This wine is a blend of Pinot Noir and Zinfandel; it was the perfect red to go with our dinner! The blend is about 80% Pinot Noir, and it has a tart cherry flavor that is so prevalent in Pinot. However, it also is just a touch more robust, due to the addition of Zinfandel. And you have to love the name. 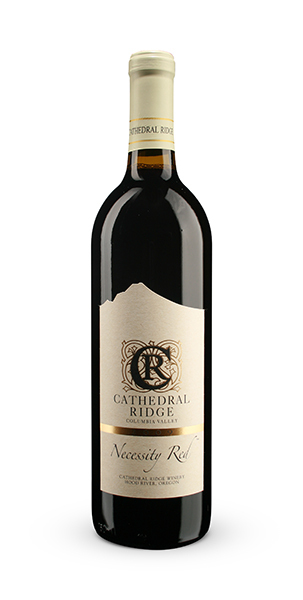 Thomas Jefferson is attributed with saying, “Good wine is a necessity of life.” Cathedral Ridge named this wine with that quote in mind. The last day of our Michigan vacation Jon and I headed with my cousin Megan to get out of the house while Grandma was napping. It was the last day of our vacation, and we had a few hours to kill. We considered going to the Kalamazoo Institute of Arts, but decided instead to go to another winery. I had googled a couple of options in Kalamazoo, and wrote down an address based purely on the look of their website. So, we really had no idea what to expect when we walked in the door. The building is a 1970s style office building that I imagine was converted rather than built for this winery. When I was young there were several of this style of building at home, but they have mostly been remodeled or replaced. It is covered in dark cedar shingles and doesn’t really have that winery “look”. We walked in and the owner and a server were there (the server explained that she was a bit new at this, and that she was filling in for harvest). Megan and I bellied up to the bar, and Jon decided to sit this tasting out – he fully intended to sample some of mine though! Lawton Ridge Winery’s grapes come from the Lake Michigan Shore AVA. It is an AVA in the southwest area of Michigan, with warm days and cool nights, but close enough to the breezes coming in from the lake that it doesn’t get quite the same hard freezes as the rest of Michigan. It is home to many of the states wineries. I haven’t had much of an opportunity to travel this AVA and sample the wines of the region, but I will be getting out there at some point! The tasting fee at Lawton Ridge is $5 (refundable with purchase) and you can choose six wines from their list to taste. The tasting list here is still fairly extensive (about 15 wines), but nowhere near as robust as the menu at Sandhill Crane. Jon asked to sample the Chardonnay – so I chose that one as my first wine. It was a nice un-oaked Chardonnay with just the tiniest hint of butter – it is aged in stainless steel, so I’m not sure where the butter came from. Next I tried the Riesling, which I was expecting to be sweet, and it was, but I was just not that impressed with this one. It was sweet competing with something else (maybe a woody taste?) and it just didn’t do it for me. Next I moved on to the Traminette, which is a varietal that we don’t have at home, so I was interested in trying it here. Traminette is a hybrid of Gewürztraminer and Joannes Seyve (I hadn’t heard of this one before) that was created in 1965, and this one did have some Gewürz characteristics (don’t I sound smart, saying Gewürz?). It had a slight floral note, and a flavor of ripe melon. All in all a nice wine. The first red wine that we tried was the Lawton 3, which was a blend of Cabernet Franc, Cabernet Sauvignon and Merlot. It was very fruit forward with light tannins. This wine was good, but it did not have a lot of structure. Jon likes his reds to be more robust than this one, but I liked it. After that I sampled the AZO Red, a blend that is named after the airport code for the Kalamazoo airport. An airport that I have done a fair bit of sitting around in actually! AZO Red is a nice summer red wine, with lots of raspberry flavor and a light mouthfeel. I followed with their 2010 Rose, which was crisp and sweet with a strawberry flavor. I am a big fan of a nice Rose, and this one was pleasing. The Kzoo Daily Red that I tried next wasn’t a big crowd pleaser, it was just a bit too sweet for my taste, and didn’t have a lot of structure. It is a drink now wine. I finished off the tasting with their Late Harvest Vignoles, which is a blend of well, duh, Late Harvest Vignoles, and Vidal. This wine was a best in class winner, according to the tasting sheet, and it had a nice tropical fruit flavor and balanced sweetness. All in all, Lawton Ridge had some nice wines. And they were very affordable, with most priced between $9.95 and $12.95. We certainly don’t find wines at those price points frequently at Washington wineries! And if you are feeling parched after your tasting, you can enjoy a glass of one of their wines for $3-4. What a stroke of luck that we stopped in here! My Aunt and Uncle went to Door County Wisconsin on vacation a few weeks before we visited them in Michigan, and took their bicycles along with them to see the sights. On one excursion, they went wine tasting to a few different wineries, and the third place they stopped at was Harbor Ridge Winery in Egg Harbor, Wisconsin. Harbor Ridge Winery is Door County’s newest winery, but they apparently share a winemaker with Door County’s oldest winery, von Stiehl. They have over 25 varietals, both fruit and grape wine, and they claim to have something for every palate. My Aunt and Uncle liked several of their wines, so that is probably true. My Aunt told me that they only selected the award winning wines to taste, and that this wine was the last on the list. They were kind enough to bring home a bottle to share with us, and we opened it up for dinner with the family. It is fermented from Concord grapes, which most of you will recognize most often from grape juice. Well, this wine tastes like grape juice – sweet like grape juice but with an alcoholic kick! This was an easy drinking wine, with very low tannin. It is a drink now wine that doesn’t have a lot of structure, but drinks well for summer! 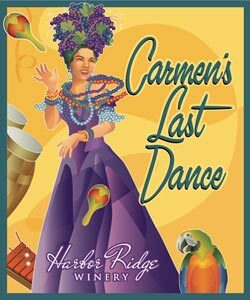 We did a completely unsophisticated food pairing with crabcakes, corn on the cob, Spanish rice, and salad, and everybody enjoyed it. Maybe one of our future trips will be to Door County, Wisconsin! After not being to many weddings in a while, I have now been to two in two months’ time! One in Washington and one in Michigan! So, remember the purpose of our trip to Michigan was two fold. My cousin’s wedding – and visiting my Grandma. Saturday, September 8th was the wedding portion of the trip. The wedding was two parts – the church wedding was at 2 pm, and the reception was at 5 pm. We had a relaxing morning on Saturday reading, surfing the net and working out in the workout room in the hotel (hello treadmill!). Then we got ready to go and heading out to the church – St. John the Evangelist at Michigan State University. The service was beautiful, and the church was more progressive than other Catholic churches I’ve been to (bongo drums!). The choir was fantastic – and they really had fun with the hymns. It is in this same choir where my cousin met his lovely fiancee (now wife). After the wedding, there were a couple of hours before the reception. Jon and I went and got some coffee and perused a used bookstore that had all sorts of fabulous Civil War books! If I lived there, I would probably visit it regularly. But I behaved myself, and left without buying anything. I already have a tall stack of “books to read.” Several stacks, if you must know… I blame the fact that I have to have a full time job. If I had that anonymous benefactor, I wouldn’t have to work and would have way more time to stay up on my reading. And these blog posts would probably be a lot more timely too… Just sayin’. Click here to donate to my PayPal account (just kidding!). So, after killing a bit of time at the bookstore and the coffee shop, we headed over to the reception, which was about 15 minutes away in the next town over – Grand Ledge. 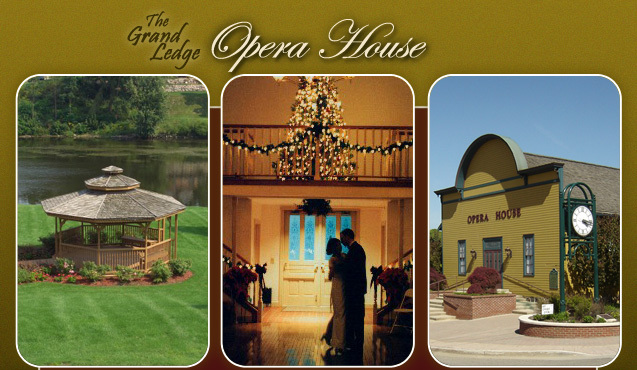 It was at the historic Grand Ledge Opera House. The building was built in 1884 as a roller skating rink – I didn’t even know they had roller skating back then! – and then was converted to an Opera House around the turn of the century, to be used as a theatre for vaudeville acts and local entertainment. The Opera House has been converted to a modern facility, but does maintain some of its original charm. Then we headed upstairs for our sitdown dinner. Toasts were made, jokes were cracked, my cousin’s obsessive love of Star Trek was mocked (numerous times), and our meal was blessed. And it was delicious. Dinner included your choice (or all 3 if you wanted!) of potato salad, spinach salad with berries and cheese crumbles and an Asian style salad with sesame seeds, shredded carrots and artichoke hearts. I didn’t have the potato salad, but the other two were amazing! Then on to the main courses. You could have four types of kebabs: vegetarian, chicken, beef or shrimp. They were all lined with tomato, yellow squash (or zucchini to my mom), and onion, plus the meat selection you chose. The next table contained a do it yourself mac and cheese served fancy style in martini glasses, with your choice of white cheddar or regular cheddar, and with optional toppings of bacon bits, tomatoes, shredded cheese and something else I can’t remember (maybe green onions?). After that, you could select your choice of four types of potatoes in ramekins: garlic mashed, mashed sweet potatoes (topped with nuts! ), and two other types – sorry my memory is failing me! Then, if you weren’t already stuffed, you could have baked apples (YUM!) and a pulled pork sandwich. 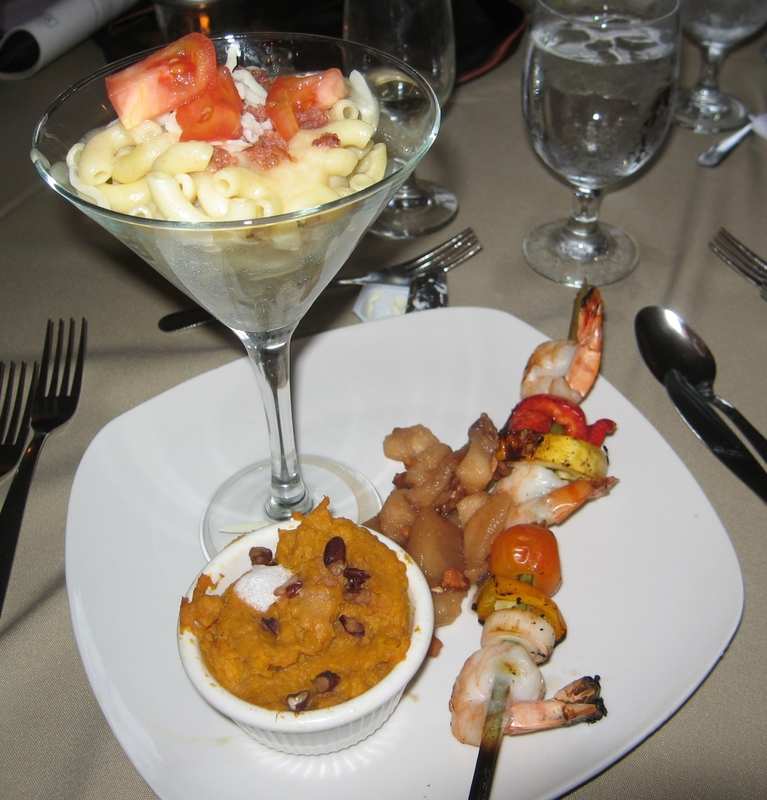 The Wedding Dinner – Great Food and Lots of It! Following dinner, there were more cocktails – still your choice of red (Good Harbor – Harbor Red) or white wine (Uncle John’s Apple Honey), beer (Budweiser), or you could have an Appletini! The Appletinis were garnished with a couple of slices of Granny Smith apple. The Appletinis were delicious – fun and refreshing – and they coordinated with the wedding colors! So for the rest of the evening, we laughed and chatted and caught up on lives… and I even danced a little. Hanging out with the family was great – I enjoyed seeing a great couple start their married lives together, and I got to spend time with my family. What a fantastic day!